The color changes within the Snow Blossoms Shawl make each motif different and create a wonderfully changing color palette throughout the entire shawl. 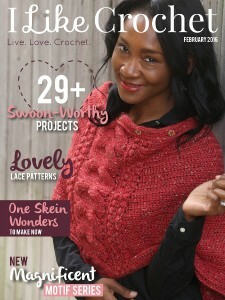 Part of I Like Crochet’s Magnificent Motifs series, this easy pattern allows the crocheter complete control over the finished size of the finished piece. 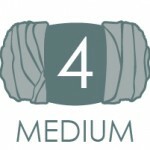 Shell: (sc, hdc, 2 dc, ch 2, 2 dc, hdc, sc) all in indicated st.
Shawl is constructed using join-as-you-go motifs, which means the shape of the shawl is very customizable. Shawl as designed is three rows of motifs decreasing in number (10-9-8), creating a trapezoid shape. You can increase or decrease the length by adding or subtracting motifs to the first row, which will change the number of motifs you need for the other two rows. 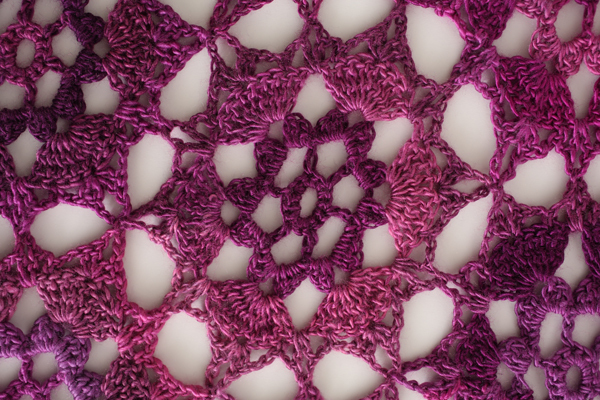 You can also change the shape of the shawl by adding more rows of motifs. 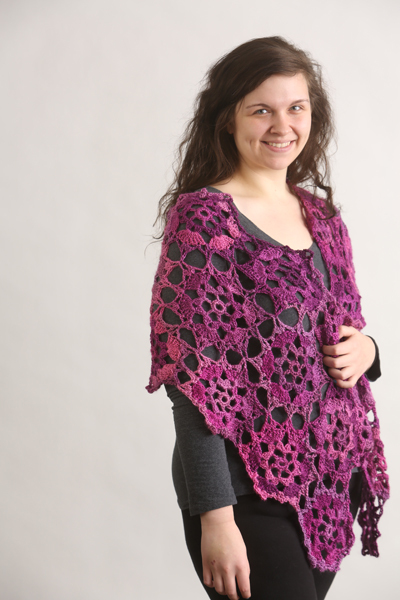 Just be aware that if you are adding more motifs to change the shape of the shawl, you will need additional yarn. Pattern is written with complete instructions for the first six-sided motif. 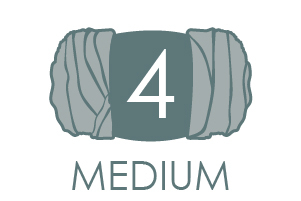 As all of the motifs are constructed the same way for the first four rounds, instructions are only provided for round five for the other motifs, as this round changes for the join-as-you-go technique. The first row has motifs joined in a straight line, so as you complete additional motifs, only one of the six sides is joined to the previous motif. When you start the second and third rows, the starting motif is joined on two of the six sides, and then the rest of the motifs on that row are joined on three sides. Ch 6. Sl st into 1st ch to form a ring. The first motif follows directions for rounds 1-4. To join this motif on two sides, follow the directions for round 5 below. Weave in your ends and block shawl.